Finding a job is challenging for most of us at the best of times. Regardless of if you are looking for part-time or full-time work, the fact is that jobs that are available in your area are in a variety of locations online. That makes it easy to miss an opportunity. Google is trying to address that with a new Jobs Near Me search that is rolling out today. By typing in “jobs near me” in Google on your phone or on the web, listings of jobs that are available in your area are provided to you and you can filter those down to particular types of job, part-time or full-time and other filters to try to find the right job for you. Once you find a job listing you are interested in, tapping it will take you directly to that company’s site where you can start the application process. the company announced at I/O this year. Leveraging, “Google’s machine learning capabilities to power smarter job search and recommendations within career sites, jobs boards, and other job matching sites and apps”. 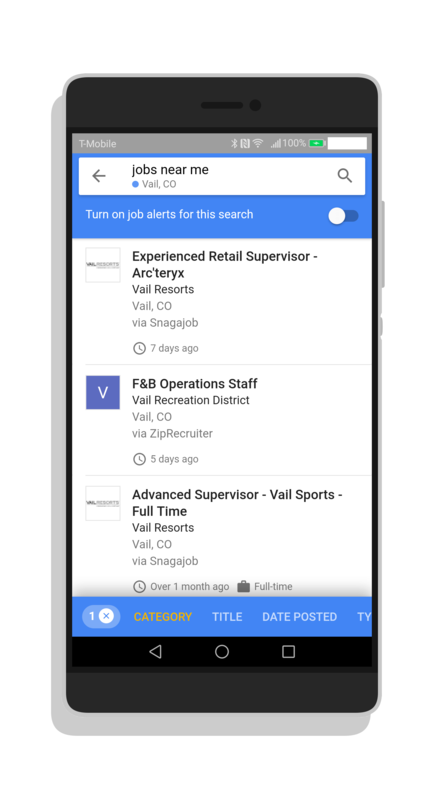 Part of this new feature in Google Search is an alert option which will send notifications to you on new job postings that meet your criteria. This means you can step away from the job search for a few hours but not risk missing a new job listing. The new feature is rolling out now and it is a server-side update. Just make sure you have the latest version of the Google app on your phone.